The first book club selection for the Global Read in 2016 hosted by the Charter for Compassion. Summary: The Compassionate Life is a series of explorations on different aspects of compassion, written as part memoir and part journalism, with an emphasis on profiling compassionate people around the world. Marc Barasch spends time with the homeless, learns meditations from Buddhist monks, and observes a camp that brings together Israeli and Palestinian girls. In the last couple of weeks, I’ve seen both evidence of the Good Eye and judgments from “holy know-it-alls,” so I’m not sure we’re there yet. Practicing my Good Eye skills, I’ll focus on the positive examples. Practicing my Midwestern practicality, I’ll work to build on those positive examples and not assume that they will replicate all by themselves. Thoughts: I amused myself with what I saw as a gender-traited difference between Twelve Steps to a Compassionate Life and The Compassionate Life. Working through Karen Armstrong’s book, I’m fairly frequently frustrated by the smallness of the vision compared to the great problems in the world — last week’s post, for example, felt puny compared to the sad news of the week. Marc Barasch has the opposite problem, though. He focuses on the most extreme examples — people who risked everything to protect Jews during the holocaust, kidney donors who give up an organ for a stranger, and a father who enters into a relationship with his daughter’s killer. My frustration, here, was that the models were far more noble than I can ever be. As readers, then, we have an opportunity to find middle ground between these two approaches. The most useful thing I got from The Compassionate Life was the tonglen meditation, where I breathe in suffering and breathe out lovingkindness. There’s been lots of suffering in the last month to try this out on and the tonglen meditation reliably gets me to a less stressed, but more sad, space in my body. I’ve discovered an occasional surprising side effect to the tonglen meditation. Of course, I always start my focus with the people I perceive as the victims and their families and friends. Sometimes, though, I’m suddenly aware of the suffering of the perpetrators and their families and friends. It’s disconcerting and there’s not much support in our society for expressing sympathy for the bad guys, so I keep it to myself. The Compassionate Life had some help for me even if it was a more extreme example than I will, hopefully, ever have to face. Chapter 10, Loving the Monster, profiles a killer and the father of that killer’s victim because they have managed a mutually beneficial relationship as a result of the father’s compassion for the murderer. So, at least, I’m not the only one to experience some compassion for someone who is completely out of the circle of those we believe deserve compassion. Unfortunately, it’s not universal. I still find myself with frustratingly small amounts of compassion for people that act in ways that I see as hateful or arrogant. Since I completed a quick read of Twelve Steps to a Compassionate Life earlier in the year, I know that topic will come up later. I don’t need to push myself on that for now. I read The Compassionate Life for the Global Read in 2016 hosted by the Charter for Compassion. But I didn’t manage to participate in the conference call that culminated that event. I’m looking forward to the next book in this series, which seems very appropriate for this election year: The Reunited States of America: How We Can Bridge the Partisan Divide by Mark Gerzon. Appeal: The Compassionate Life is a good addition to the compassionate library. 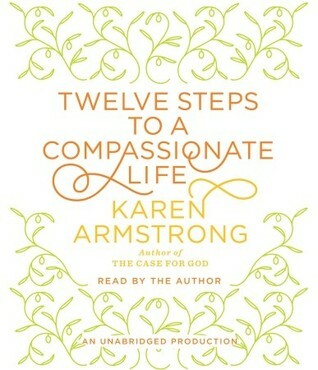 I relate better to Twelve Steps to a Compassionate Life, but I do think there’s a gender component, here. A man might do better starting with Marc Barasch’s book.